Whilst at the women’s day function with best friend Mr. F, brother Faris informed me that he would be visiting the camel souq with Paul and Mo on Friday afternoon immediately after the midday prayers. 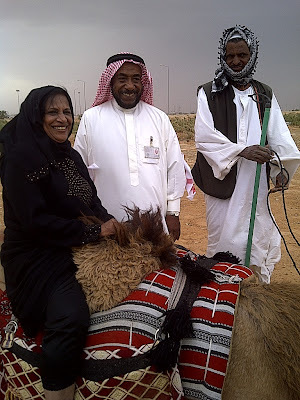 As mom had just arrived in the Kingdom a few days ago I thought that it would be an excellent opportunity for mom to experience Saudi culture first hand. Brother Faris agreed to mom and I hopping along with them. Immediately after the midday prayers on Friday, Mom and I made our way to the bus stop. Brother Faris was on time to pick us up and we made our way happily to the camel souq.The souq is located on the Dammam Road, heading east out of Riyadh.A huge area of around five kilometers square is home to the largest collection of camels in the Middle East and is a market that has probably stood the test of time with very little changes over the last few hundred years. 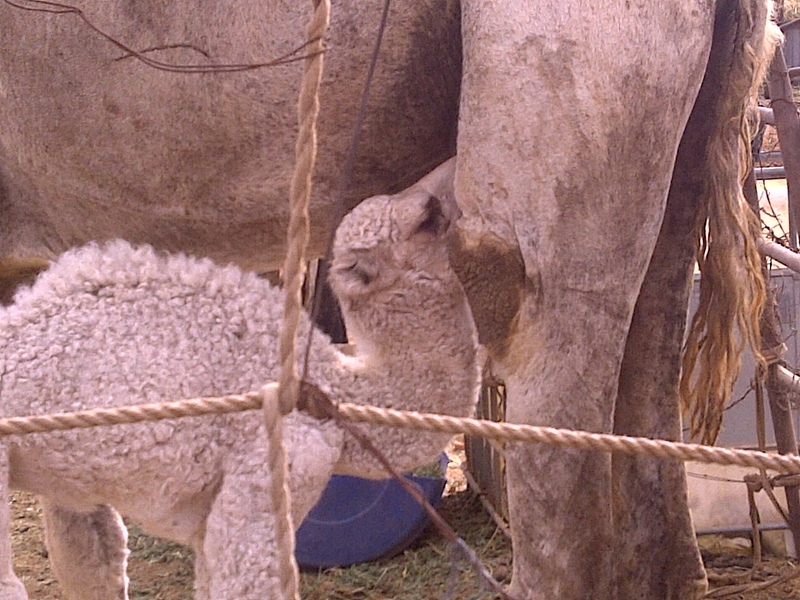 As soon as we arrived at the souq, we instantly fell in love with the baby camels. The souq is guaranteed to bring out the ‘aaaahhh’ factor in almost anyone.Brother Faris frequents the camel souq quite often and hence he was well acquainted with many of the camel owners. There was a group of Saudi gentlemen who reside in the city but visit the souq on a weekly basis to spend time with their camels. They invited us to join their gathering. 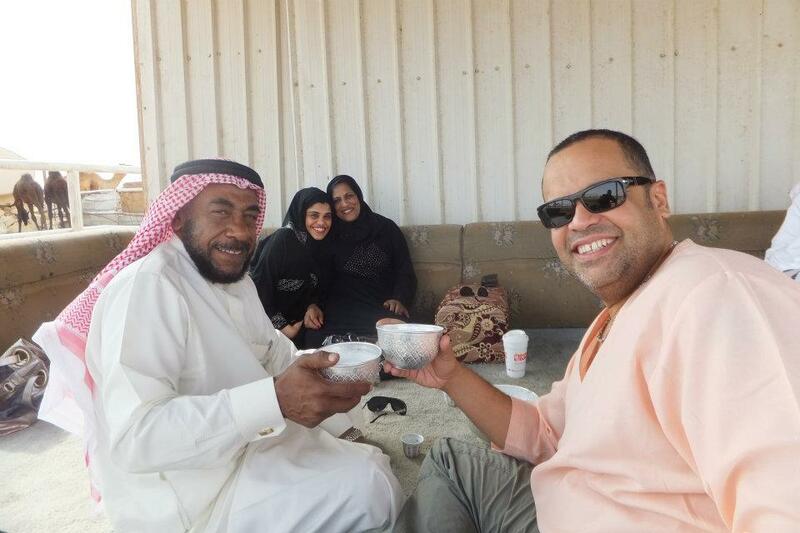 They offered us Arabic coffee (qahwa) and dates. One of the gentleman asked his Bangladeshi employee to milk one of the female camels. He wanted us to taste camel milk and then went on to explain the benefits of camel milk.Camel milk is supposedly more nutritious than cow milk. According to the Huffington Post, camel milk has been utilized medicinally for centuries by nomadic people. It is apparently the closest to a human mother’s milk and contains 10 times more iron and three times more vitamin C than cow’s milk. At the beginning of 2011, a group of Arab researchers announced that they have made a scientific breakthrough by developing a medical formula for treating cancer using camel’s milk and urine. I was quite surprised that camel milk is quite frothy and thick. From a distance it looks like thick fresh cream. 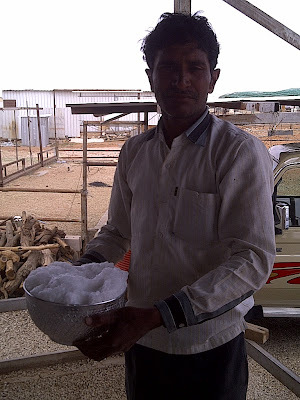 If you ever travel through the desert and pass by Bedouin people,make sure you do try the camel milk that they will offer you. 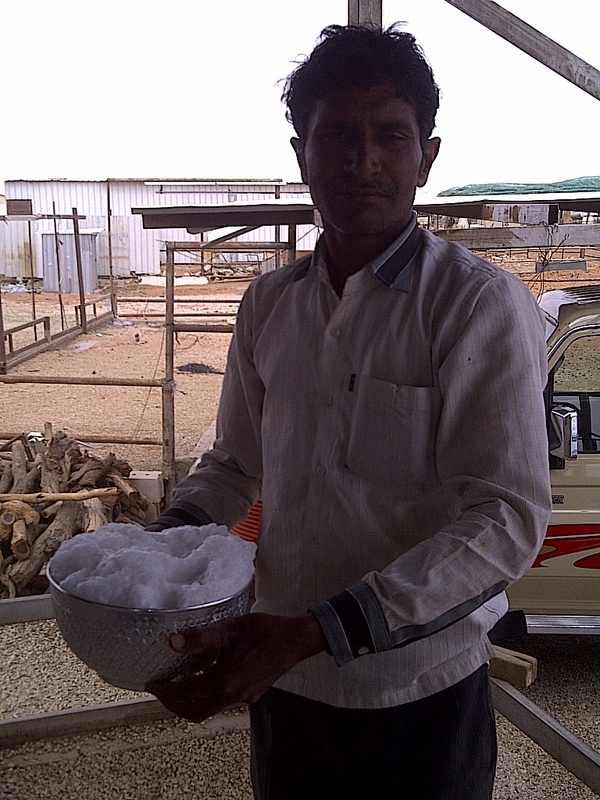 Camel milk is also available in most Saudi supermarkets.Most camels within the Kingdom are female. They are reared for their milk in dairy herds.The male camel is usually reared for camel racing and those that are not strong enough to race any more are usually culled. Many camels found at the enclosures within the souq are also kept as pets by Saudis.The normal life span of a camel is 40 years, though a working camel retires from active duty at 25. Whilst wandering throughout the souq I realized that camels come in various different shades. We seen white camels, black camels and of course the usual tan coloured camels. Mom and I could not get over their sheer beauty. Their faces were so adorable along with their striking eyes. Camels are graced with a double layer of eyelashes to prevent dust and sand from making its way into their eyes.Thick bushy eyebrows shield a camel’s eyes from the desert sun; and when the camel places its foot on the ground its broad, flat, leathery pads with two toes on each foot prevent it from sinking into the sand. Camels are also extremely sensitive animals. 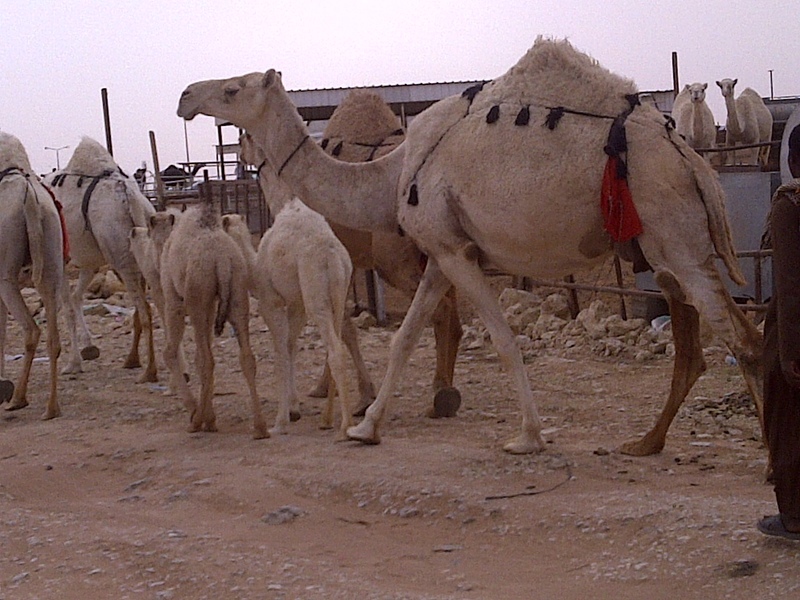 We witnessed a female camel running behind a van.Inside the van there was a small newly born baby camel. 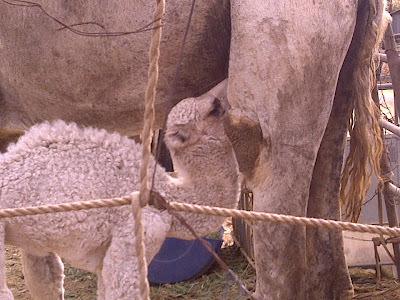 The owner was moving the baby camel to another enclosure temporarily. 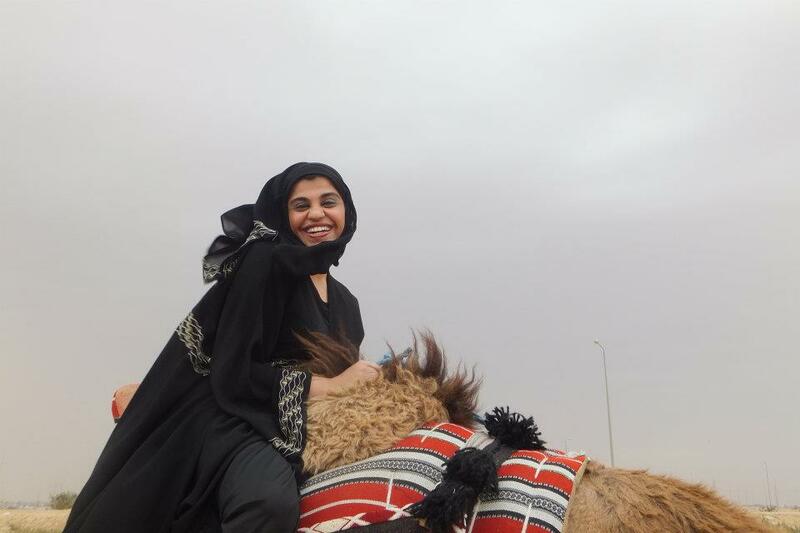 The mother camel was however distressed and as we witnessed her running down the road we sympathized for her and felt her pain. Branding marks or ‘wusum’ is often applied to the neck, legs or rump of the camel which shows ownership of the animal.As we made our way throughout the souq by foot, we eventually stumbled upon a souvenir shop that contained many bedouin type arts and crafts. After browsing through the shop and buying a few items we then headed to the desert where Brother Faris arranged a camel ride for all of us.The weather was ideal. It was cloudy and overcast with slight drizzles in between. Mo and Paul were such fun company. They kept mom and I entertained throughout the day. It was certainly an afternoon and an experience that I will cherish forever. How do I get to the camel souq? Continue along the Dammam Road for approximately 10 kms, whence you will see endless camel enclosures on your left. Come off at the next exit, following signs for Thumamah, and the camel souq is on the left hand side of the road. Another way to reach the camel souq is from the airport. Take the eastbound road signposted Private Aviation and drive as far as you can go – past the end of the airport runway, right through the check point, across the junction and when you meet the junction at Janadriyah, turn right – past the BAE Systems Salwa compound and continue straight for the next 20km. The souq will appear on your right hand side.